Nadir Divan-Beghi Architectural Ensemble consists of a madrasah, a khanaka Sufi hospice and monastery, and a hauz pond. 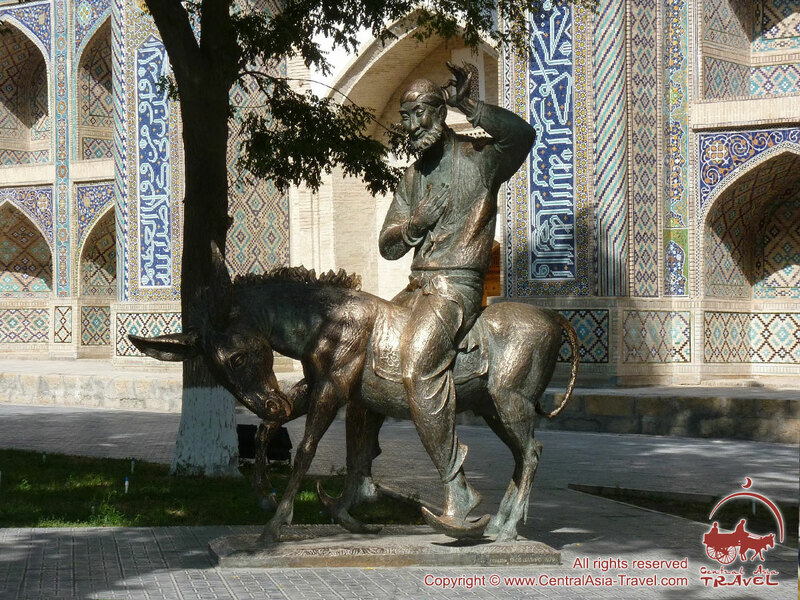 The ensemble was constructed by order of the vizier Nadir Divan-Beghi who served for Imam Quli-Khan, one of the most powerful rulers of Ashtarkhanid dynasty. Nadir Divan-Beghi Madrasah was built in 1622. It is located in the eastern part of the Lyab-i Hauz Square. 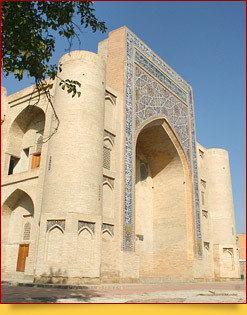 The vizier had initially planned and constructed the building as a caravanserai but Imam Quli-Khan unexpectedly called it a madrasah at the opening ceremony. That was why they had to build on the portal, façade side towers, loggias, and the second floor with hujra cells for students to stay in. The main feature of the madrasah is its absence of a classroom; they just did not build it on. 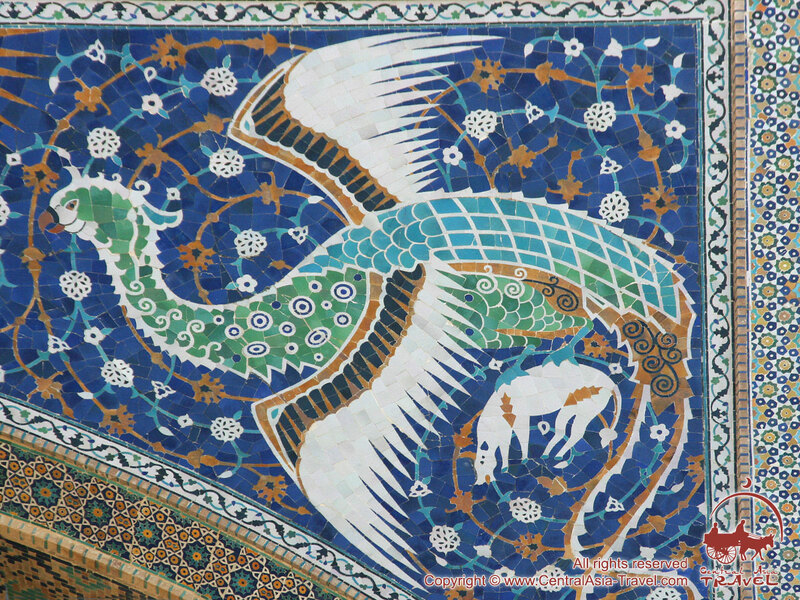 The portal is decorated with two mosaic pictures of the mythical flying creature Simorgh (also spelled simurgh, simurg, simoorg or simourv) holding fallow deer with its claws and heading towards the sun. The inscription on the portal says, ‘Allah is great and Muhammad is his Prophet’. 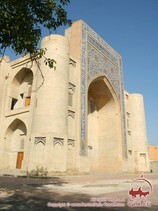 In 1993 Nadir Divan-Beghi Madrasah was included in UNESCO World Heritage List. 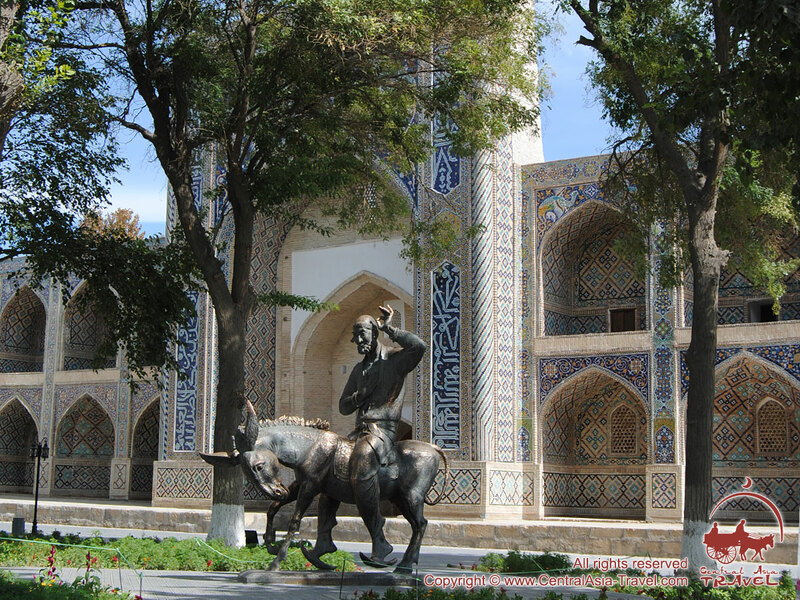 Across from the madrasah stands Nadir Divan-Beghi Khanaka. It was built in 1619 - 1620, earlier than the madrasah. This khanaka is a massive structure with hujra cells along its walls and in the corners. The portal of the building has an originally stretched shape and is decorated with inscriptions in Arabic script along its border and with flowers. 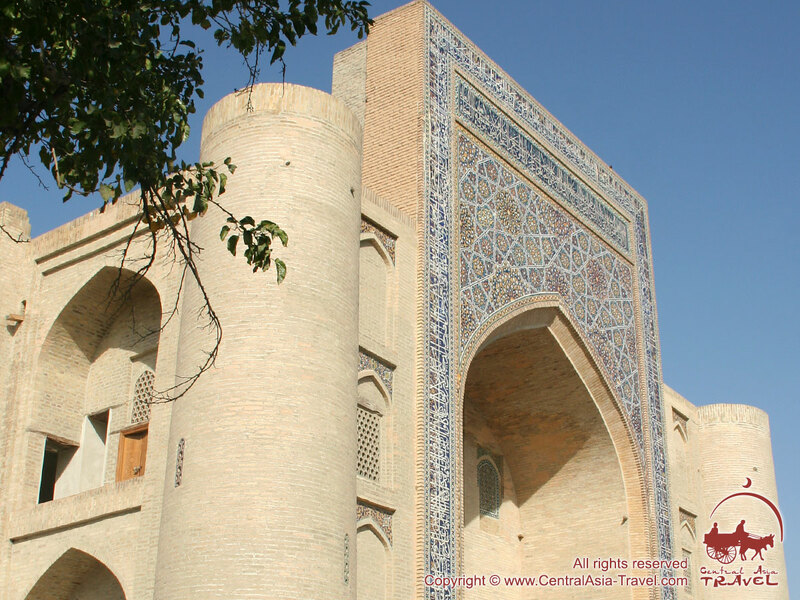 Thanks to its large hall with excellent acoustics and convenient location, Nadir Divan-Beghi Khanaka was Bukhara religious and cultural center for many years. 1620, earlier than the madrasah. This khanaka is a massive structure with hujra cells along its walls and in the corners. The portal of the building has an originally stretched shape and is decorated with inscriptions in Arabic script along its border and with flowers. 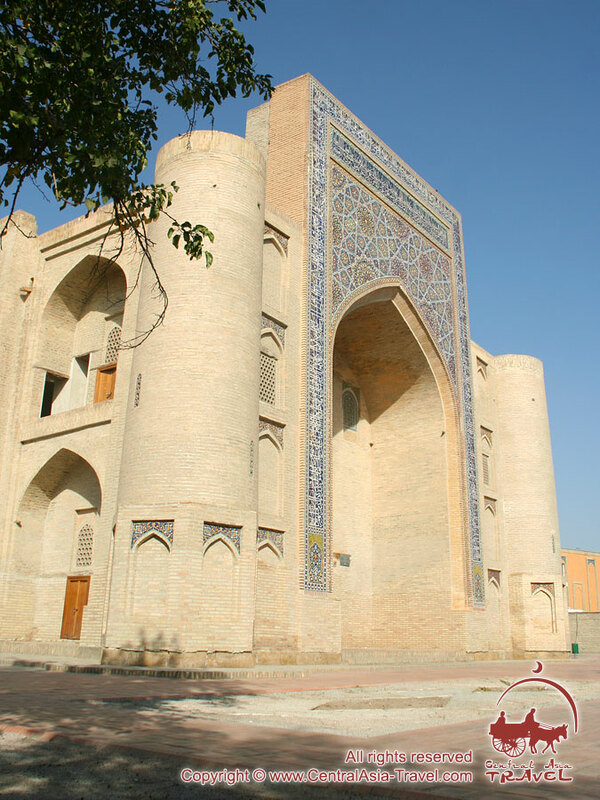 Thanks to its large hall with excellent acoustics and convenient location, Nadir Divan-Beghi Khanaka was Bukhara religious and cultural center for many years. 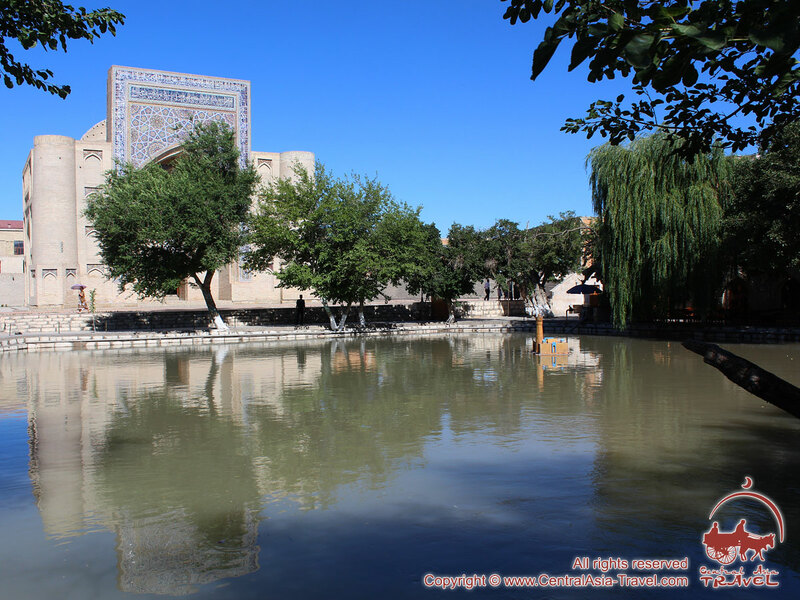 There is a large rectangular hauz pond between the khanaka and the madrasah. 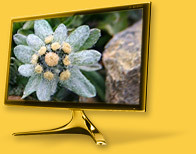 Its edges have stairs and are made of solid blocks of yellow limestone. 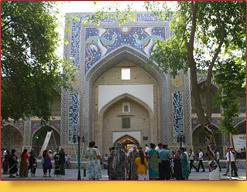 Nadir Divan-Beghi Architectural Ensemble is very popular with the residents and guests of Bukhara. 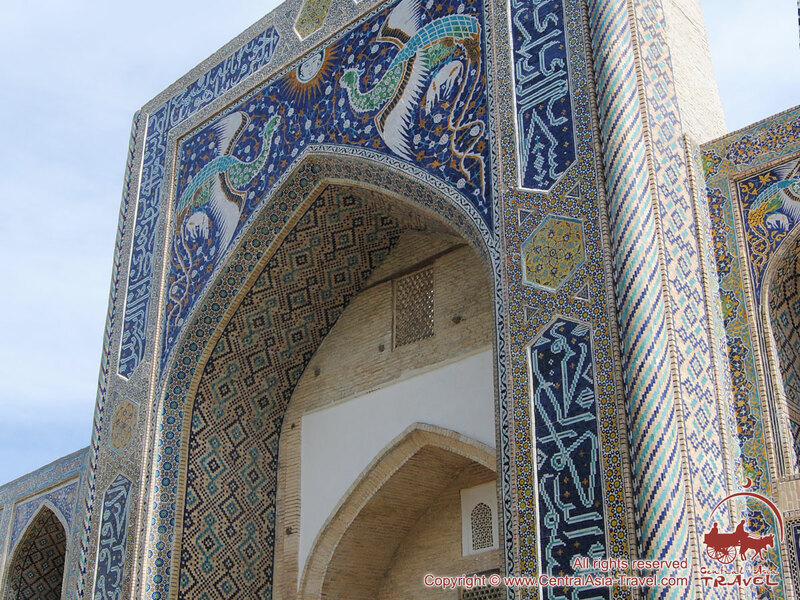 The place retains an amazing Oriental aura and allows its visitors to learn a lot from Uzbek cultural heritage through watching, listening to guides and even enjoying various folklore performances. 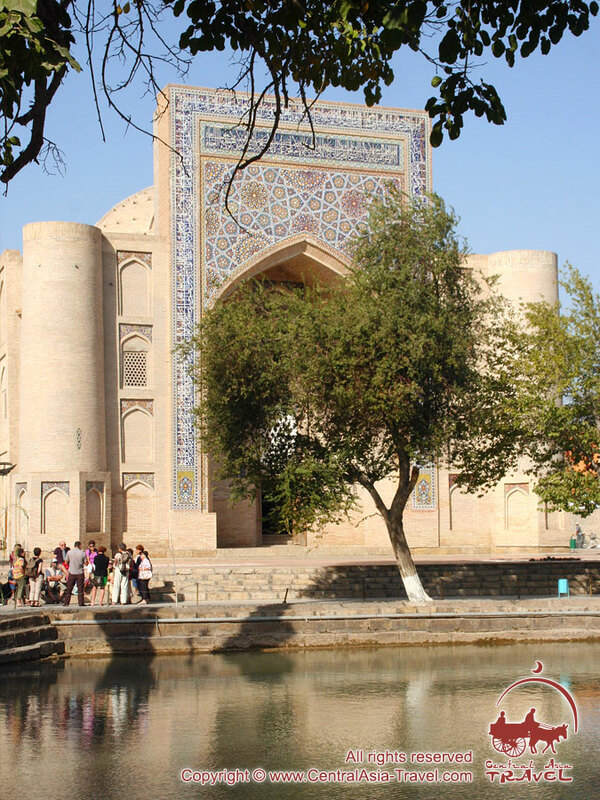 Apart from being an outstanding architectural monument, the old Nadir Divan-Beghi Madrasah is famous for a folklor show with folk dance accompanied by traditional live music and fashion show held regularly in the evenings within its premises. Folklore & Costume Dances show duration: 40-45 minutes in the evenings. Traditional live Uzbek music and stories about local musical instruments - doyra (a tambourine-like percussion instrument; also spelled dayereh, dojra, dajre, doira, dajreja), ghaychak (a bowed instrument; also spelled gheychak, ghijak), ney (a flute-like instrument) and others - played and told by the folk band Bukhorcha. 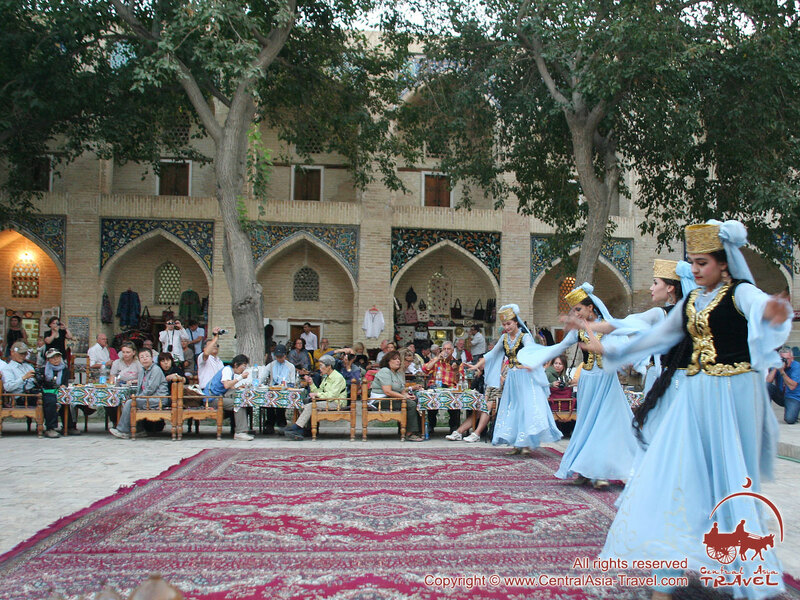 A dance show, at which traditional dances of various peoples and regions across Uzbekistan are performed to live musical accompaniment: the Khorezm folk dance, classical Fergana dance and traditional Uzbek dance will be shown together with the Arab and Tajik dances. A fashion show by Bukharian clothes designers will be held in the intervals between the dances. The models will demonstrate original collections of silk and cotton clothes combining in them the bright traditional features and modern trends in the fashion industry. If desired, the guests will be offered a delicious dinner consisting of traditional Uzbek food, such as pilaf (also spelled pilaff, plov, pilau, pilav, polow, pulaw, pulao), manti (dumplings; also spelled mantu), mastava (soup), samsa pasties (also spelled somsa, samosa, samoosa) and others, and traditional tea with oriental sweets. The khujras (cells) of the Nadir Divan-Beghi Madrasah house today numerous souvenir shops, where you can buy unique traditional handmade souvenirs produced by local artisans. 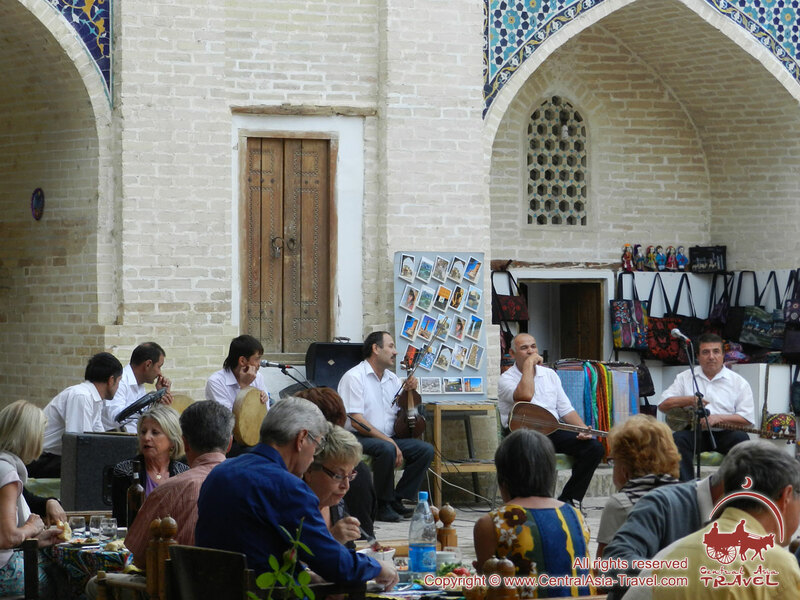 The folk show at the Nadir Divan-Beghi Madrasah will enable you to feel the bright and colorful world of Uzbek culture, which is why it is so popular among tourists.